Comet Muse: Hello twenty fifteen. Less than an hour to new year. Peppy party music reverberates somewhere in the distance, in an otherwise calm night. I am tucked in my blanket, hunched over the laptop screen with cold fingers on the keyboard, thinking of words, syllables, sentences to define what 2014 was to me. This ritual to reminisce what a year brought to us and what we gave in return, it is therapeutic and it gets even better when you prepare to bid goodbye to another set of memories, to put a final full stop at the end of another chapter, in the most peaceful manner. But this time, instead of looking back, I plan to look ahead. Sure, I had a lot of exceptionally awesome moments this year, but what is gone is gone. They have been placed neatly in my head. It is time to welcome a whole new bunch of memories that are waiting for their turn to treat us with love and hate. So a very happy new year to you dear reader. Thank you for sticking with me through various dramas of life. Oh and one last thing, ever since I stepped into law college, I barely got time to sit down and binge read at a stretch. But now as my college is almost over, I have decided that I will read a lot!!! No excuses, nothing. 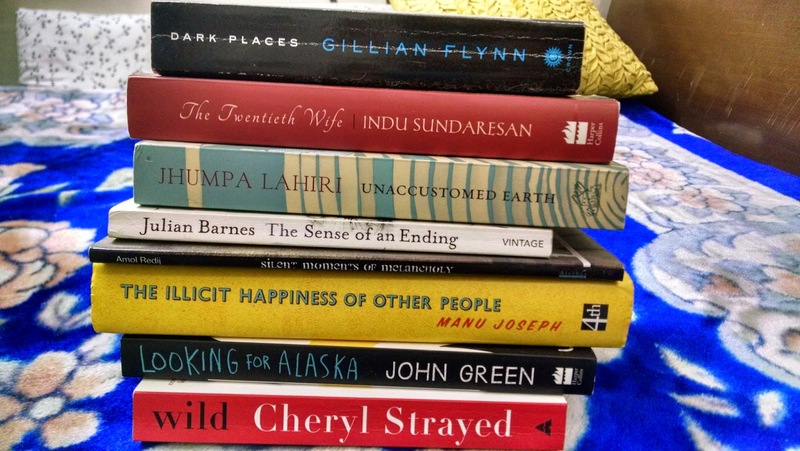 My dear friend Raaji from Writings For Life asked me to share a list of books I read this year. Pretty less, I know. But let the new year come! P.S: Feel free to share your list of books you read in 2014.
so you're a year ahead of me now, Vinati...hope the new year will be just as magic as that! haha.. that is the best way to put it. Have a great year Vinati. Yes, please do share. I might get to know some interesting pieces. Thanks for doing the tag - hope you can read a lot more this year. You are totally right about looking ahead to the future. haha.. readathon! I like it. A life that's not a drama isn't worth living. Happy New Year. Ah, not been faithful to books in 2014. Must change that in 2015! Here's to looking ahead! Let's make it change. Shall we! I love your attitude - look forward, not back - very relevant for me at the moment! Wish you a very healthy year Freya.. muaaah! DUUUUUUUUUUUUUUUUDE How the hell did I not know that you were doing law. Which college????? You are done with it? hahahah.. I'm in my tenth semester now aur ap ab jaag rahi hain.